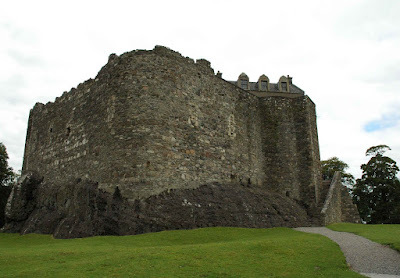 Dunstaffnage Castle sits on the West side of Dunstaffnage Bay, and to the South of Eilean Mor in Scotland. The first thing that strikes you about this 13th century castle, is that it literally sits on top of a huge outcrop of rock. This outcrop is so integral to the fabric of the castle, that the lines of the walls were altered to best make use of this natural defence. The castle was probably built in 1275 by the Lords of Lorn, either Duncan or Ewan MacDougall. Robert the Bruce captured it in 1309, and in 1470 it passed into the hands of the Campbells. The castle's walls are anything up to 10 feet thick in places, and ringed with a continuous wall walk. There are three towers built into the walls, standing at the North, East and West, with the 16th century gatehouse built into the West tower. The castle has been in the hands of the Campbells for over 500 years. It was occupied by them up until 1810 when it was rendered uninhabitable by a fire. 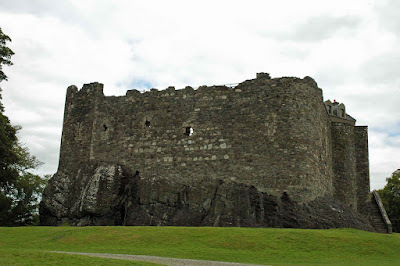 The castle is still the seat of the Campbell Captains of Dunstaffnage, and as a symbol of the clan's continued occupancy of the castle, the current Captain must spend one night a year in the Gatehouse. 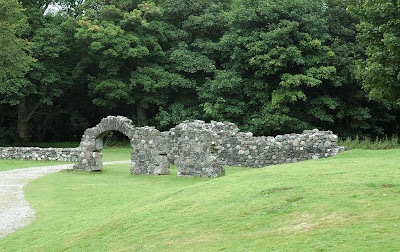 To the west of the castle, the ruins of a 13th century chapel can still be seen.